Do you love sushi?? If you do, you know how important it is to find places that serve fresh fish full of flavor. What if I told you I found a place with super fresh seafood and decent prices as well? Well if I were you, I would be pretty stoked! This is exactly how I felt last week when I was invited to Dami Sushi and Izakaya in the city of Buena Park in Orange County, California. 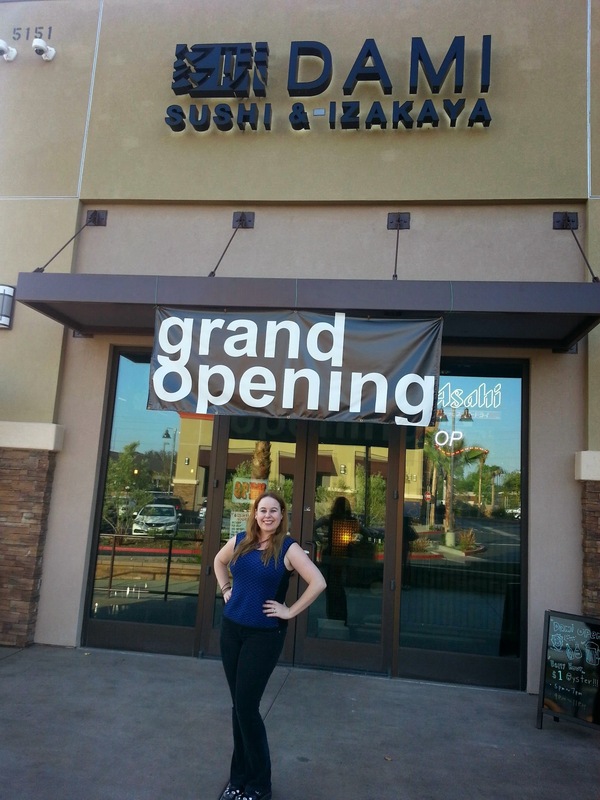 Dami Sushi recently opened March 28, 2014 and I visited their restaurant on April 22nd with my dear friend from work and man oh man we were we in for a treat!! Owners Thomas Shin and Brandon Lee truly strive for utmost perfection with their newly opened restaurant. The atmosphere inside of Dami was welcoming and bright and had trendy and modern décor both inside and outside the establishment. Upon being seated at Dami, we were introduced to a tasting menu designed to share with me the variety of options on the menu. This menu designed for the evening also included three delicious tastings of sake and a choice of beer from a variety of 11 different selections on tap! For my beer I chose the Bootlegger’s Hefeweizen and I think I made the perfect choice! Bootlegger’s is a local brewery in Orange County based out of Fullerton that my friend was quite familiar with. This beer was smooth and creamy. 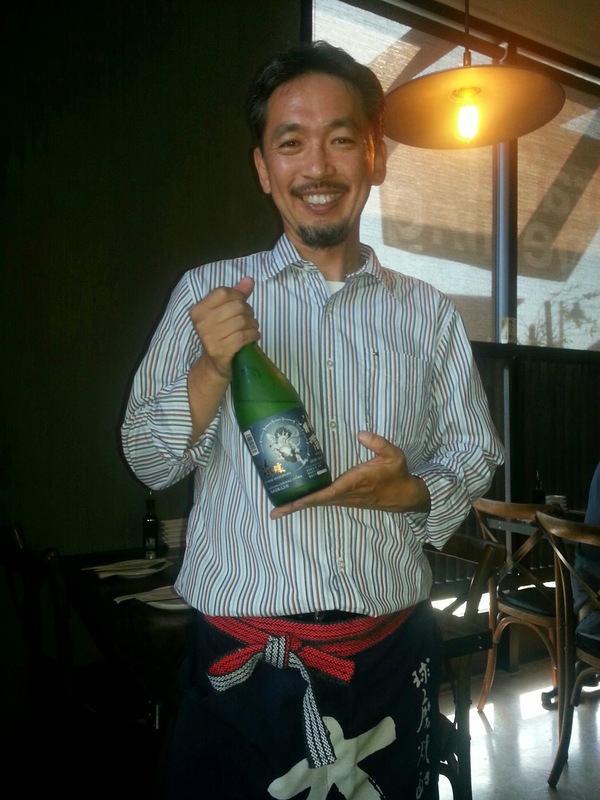 The first sake we got to sample was by far my favorite one of the evening. It was called Shin-rai Junmai Daiginjo and while this item in particular I cannot call a deal being that it is $95/bottle, I can definitely say it was one of the best sakes I have ever tried. It resembled a white wine to me, but with a distinct sake flavor. This was very light and well balanced! To start our meal we received oyster shooters marinated in sake and quail egg, as well as oysters on the half shell! For our first courses we tried a plate of three items which included; the Jawanmushi, which was a Japanese steamed egg custard with shrimp, ginko nuts, and shitake mushroom, whole grain salad with black rice, Indian millet, lentil, kidney beans, mozzarella cheese, baby mesclun, and soy vinaigrette, Siraegi (dried radish greens) rice bowl with slow cooked soy dashi, baby anchovy, rice, masago, and radish sprouts. Each of these items was full of flavor and they each had a different consistency, but we both agreed that our personal favorite was the Siraegi. The Siraegi had a great texture and there was just the proper blend of salty and savory flavors and left me to desire for more. These items were all under $10 and there was a larger portion you could order of the Jawanmushi for $16. Next, my favorite main course item of the evening arrived…This was the Dami Seafood box, which also happens to be one of their signature dishes! There were 8 different dishes of seafood which included fresh ahi (some of the best ahi I have ever had), halibut, yellowfin, abalone, salmon, chirashi, and red snapper. 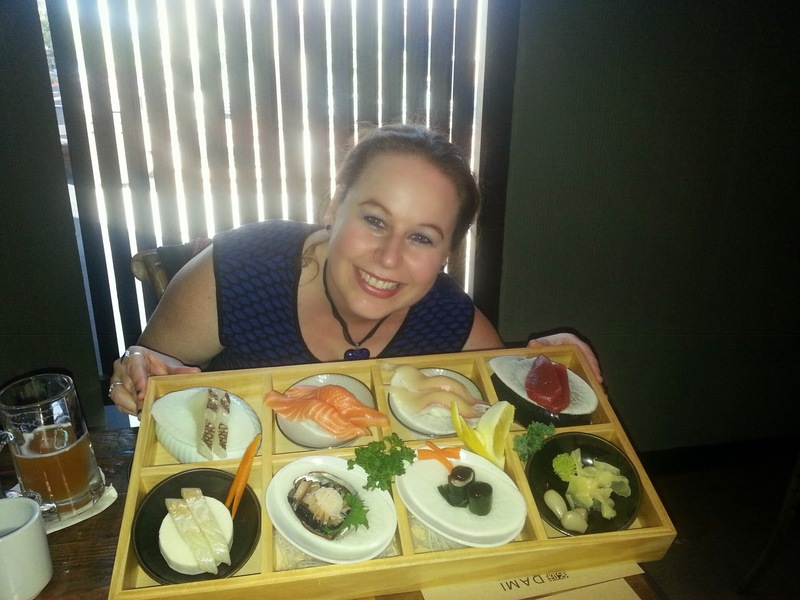 This seafood box is well worth its $40 and paired with the second sake, Jokigen Junmai Ginjo, we were in heaven! For our last dishes of the evening, we were served a Ssam-Bab Set, which is spicy pork belly, lettuce wraps and a dish of 3 amazing concoctions. The 3 items on the last dish included Msio Chilean Sea Bass (the most amazing buttery fish with decadent flavor you can imagine), Golbang Yi Muchim (Se Snail Salad), & Saewoojang (Preserved Shrimp) Rice Bowl. I heard the sea snail salad was amazing, but I was not daring enough to delve into it, so I cannot give my opinion there, but the shrimp was pretty spectacular being that it had been marinated in soy sauce for 7 days!! As I said before I was in love with the Sea Bass! The sea bass and the Seafood box are definitely what I plan to order when I go back! The last item of the evening was a unique dessert which I was unsure of upon hearing what it was, but it was literally love at first sight! This dessert was a Matcha Green Tea Crème Brulee and it was literally heaven biting into this dessert. The only bummer for me was that I had to share this dish with my friend. 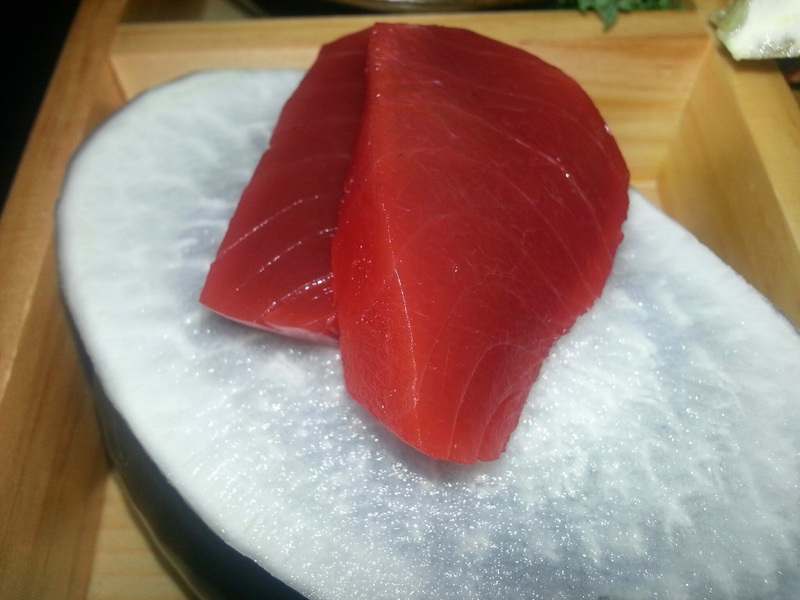 I will easily devour one of these on my own next time I visit Dami Sushi!! 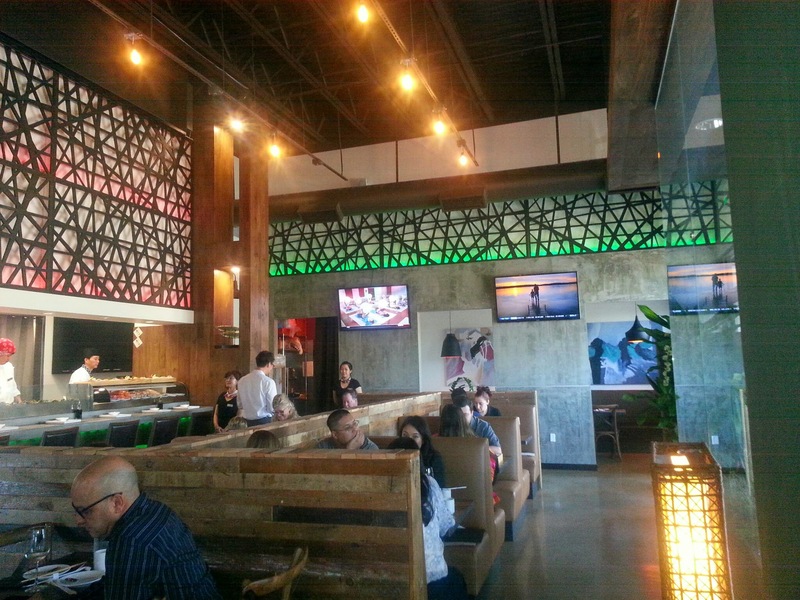 If you like what you have heard about above, you must head in to Dami Sushi & Izakaya in Buena Park soon! Their dinner entrees range in price from $10-$20 per entrée and their hours are 5:00pm-midnight! I love when places are open later in the evening like that! They will also have lunch hours coming soon! 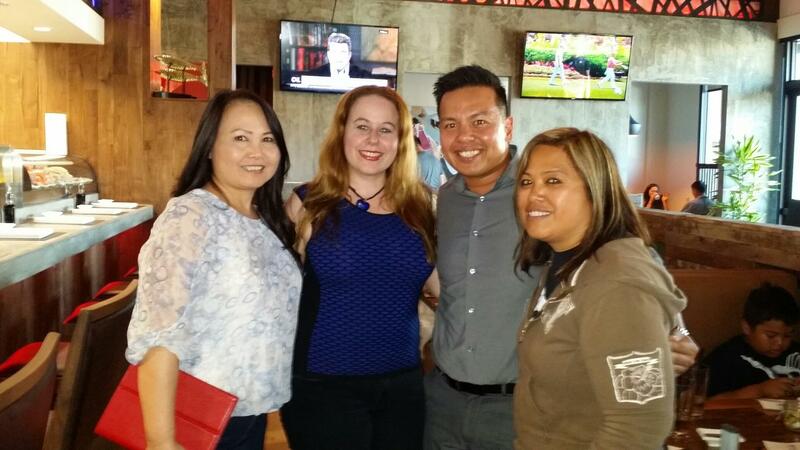 One other item, I must mention that I know all of you will love is their awesome happy hour!! 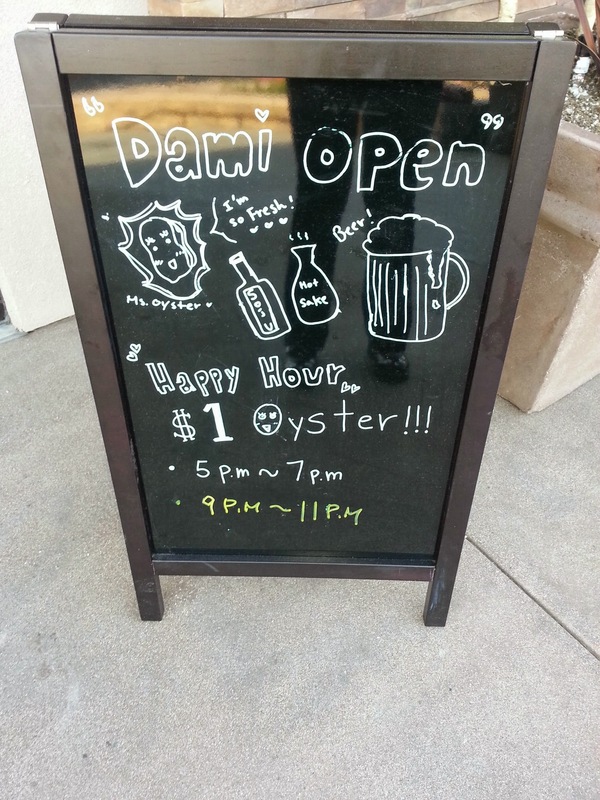 Dami Sushi has a $1 oyster Happy hour from 5:00pm-7:00pm & 9:00pm-11:00pm daily!! There were will be more happy hour menu items coming to their menu soon as well! I hope to see you at Dami Sushi soon! Please let me know about your experience below! To subscribe to my blog to get weekly deals like these and other dynamic ways to save and to live champagne dreams on a beer budget, simply scroll down & enter your email address where it says to follow blog via email. You will then receive an email asking you to confirm subscription. Simply confirm subscription and you will be subscribed. 🙂 Thank you for your time and feel free to spread the word to others that want to learn all different kinds of ways to save money on food, travel, shopping, and products:) Please feel free to like my facebook page, Dani’s Decadent Deals as well to get daily deals everyday for everything from clothing, travel, restaurants, activities, adult events and kids’ events. 🙂 Have fun saving!!! I have not been there but the Dami Seafood box looks fantastic. That’s the dish I would love to try. cool looking dishes, especially the seafood box! Honestly, I could live on Japanese food and sushi is my fav !! I’ve never been but looks delicious! I want to try the Ahi. 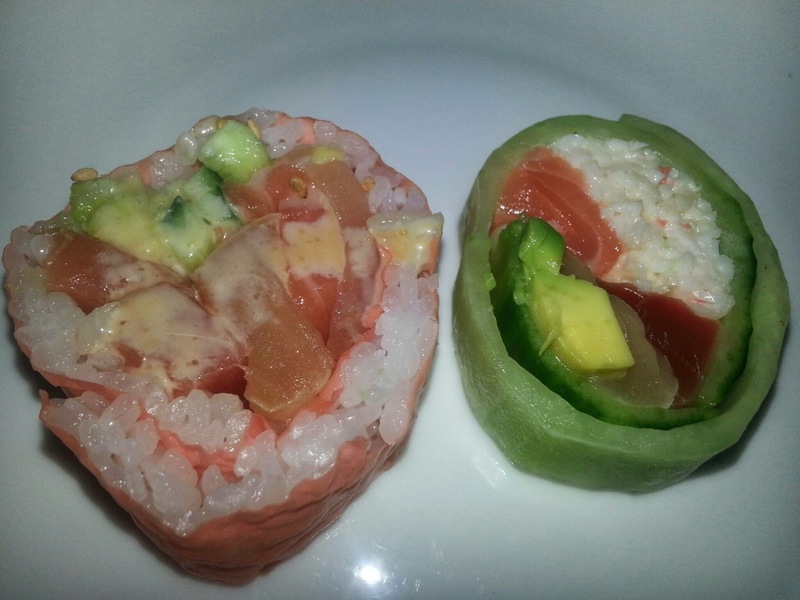 I’m a sushimi girl but my husband likes rolls so he would love to try the Love Roll. Pun intended. 🙂 Thanks for the giveaway, Dani! I have not been. 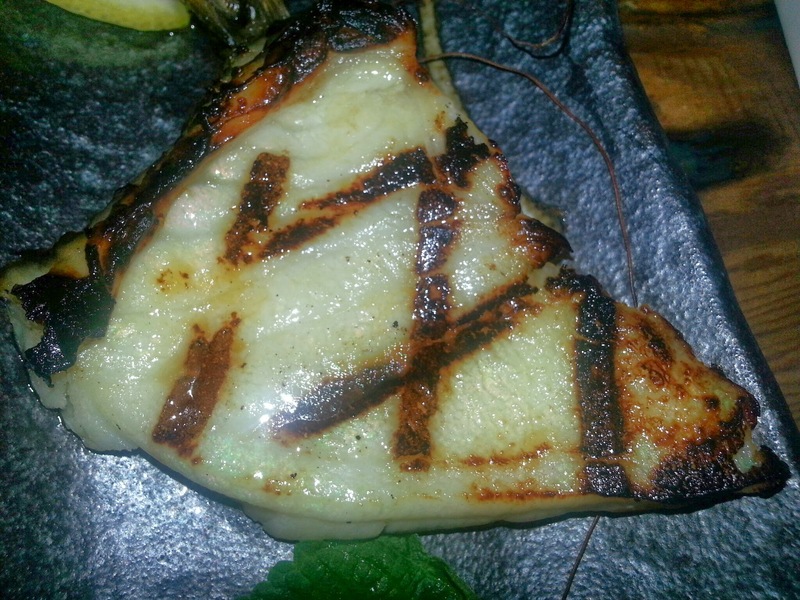 I’d love the miso Chilean Seabass. To die for!! Good luck! Japanese food is one my favorite things in the world. Yum! We really enjoy the seafood box. What a find here. My favorite food group…Sushi. Looks like an amazing find! 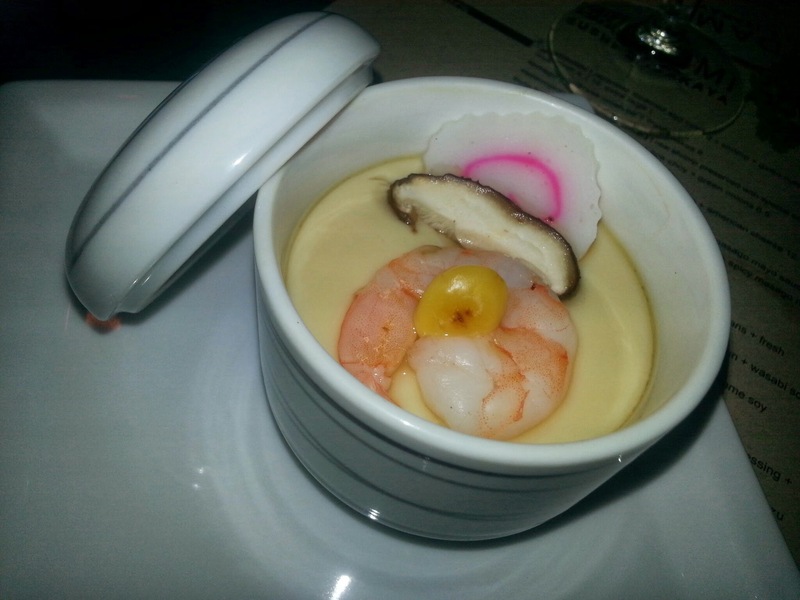 Thanks for sharing your experience – the sushi dishes look fabulous! Thanks Laurel! They were pretty amazing!! I love sushi! And i can eat 20 of it in one meal. lol Great Review!! It was amazing and we will go back together my love!! Yummm!! I’d love to try everything! I’d definitely go for the Seafood Box! Dani, it won’t let me paste. Here is my Fb share. Sorry! Lol. Thanks Deb! Have a great day! Dami that looks good. Count me in! I love sushi and this place is close by my house. I have to go try it soon! The love roll looks delicious! There more I look at the pictures, the more I want sushi! The Rainbow Roll looks delicious!!!! I love it! Everything there was truly delicious:) Good luck! 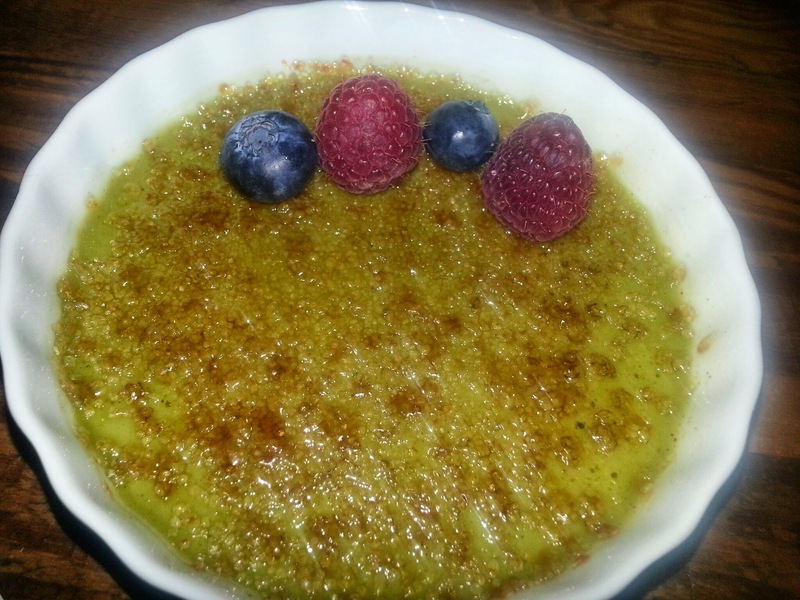 I have never been there and I would like to try the Matcha Green Teac Creme Brulee. Wow! That seafood box looks great! The Ahi sushi looks delicious actually all of it looks quite delicious. very lng time. Thank you and good luck.